Every day, scientists alight on pioneering solutions that will define the future of life on this planet, yet it isn't every day you hear about these discoveries straight from the scientists themselves. Now, award-winning science writer Jim Al-Khalili and his top-notch team of experts draw on their mastery of groundbreaking scientific research to predict what advancements will shape the future just around the corner and beyond. 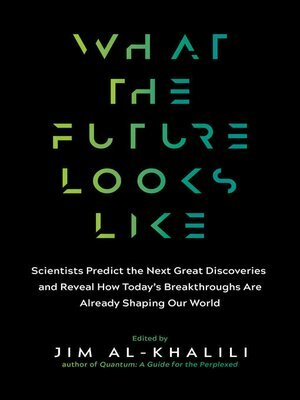 Taking in genomics, robotics, AI, the "Internet of Things," synthetic biology, interstellar travel, colonization of the solar system, and much more, What the Future Looks Like explores big-picture questions like: Will we find a cure to all diseases? The answer to climate change? And will bionics one day turn us into superheroes? Neither celebratory nor alarmist, here is entirely reality-based insight on the science-fueled future that is helping to solve intractable problems—and that's already unfolding all around us. Theoretical physicist, author, and broadcaster Jim Al–Khalili's numerous other books include Quantum and Paradox. In 2016 he received the inaugural Stephen Hawking Medal for Science Communication.